and Katie Bradford’s maiden name was a tongue twister–Roahrig. Go ahead. I dare you repeat that three times fast and not giggle. I have never met anyone else with that name. I have not run across articles or histories or songs that include that name. Roahrig. What ancestor brought this surname to America? Roahrig, it is. The first of 12 names that I will trace this year, back to its place of origin. I started my name-hunt by visiting my Ancestry generated family tree, and ploughed through the fields of census data. Within a short while I had uncovered 8 spellings for this surname–Rohrig, Rarick, Rayrick, Roehrig, Roarig, Rearick, Rauhrig and Roahrig–with families residing in Pennsylvania, Ohio and Indiana. I found one path back to 1850 that held particular promise. I had gone backward from Katie to her father and mother, John and Matilda Kline Roahrig of Ohio, and from there I went backward to find John with his parents, Frederick and Elizabeth Lapp in 1870,1860,and 1850, always in Ohio. The 1870 data includes country of origin, and Frederick listed France while Elizabeth and all of their children claimed Ohio. 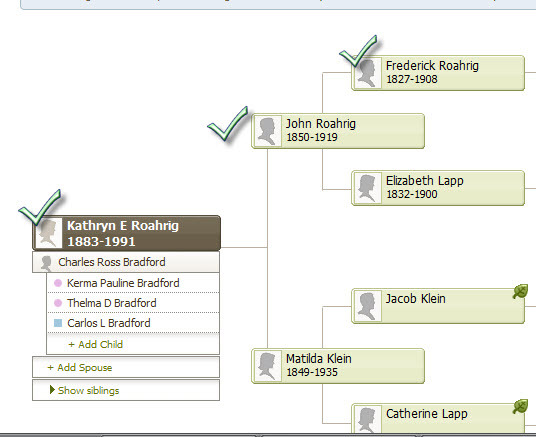 If this Frederick Roahrig is the grandfather of my Kathryn Roahrig Bradford, then he is also the Immigrant Roahrig . To gather a bit more about Frederick’s country of origin I returned to the 1880 census, which asked folks to name not only their country of origin was but also their parents’. Interesting! Frederick Roahrig states that he and his parents are from Alsace. Elizabeth states that she is from Ohio, and that her father was from Wurtimberg, Germany, and her mother was from Alsace. Now it was time for me to verify that this path connects the correct dots from me to the Immigrant. I expanded my search to include Find A Grave, and was rewarded with confirmation through obituaries and photos!! Fellow family historian, Doug Kreis, has done some remarkable work, and lucky for me, his research includes the Roahrig family! Just what sort of name is Roahrig? German? French? Why did he and his parents immigrate, and what brought them to Adamsville, Muskingham County, Ohio? I have hunches and a few clues. Stop back next week to see where they lead.